Torontoist invited me to contribute to this year’s Heroes and Villains (“the people, places, and things that we’ve either fallen head over heels in love with or developed uncontrollable rage towards over the past twelve months”). Below is my hero entry. Interesting to read similar sentiments in The Toronto Star. Now that some of the worst-case economic predictions are playing out, smugly saying “I told you so”â€”while satisfyingâ€”isn’t particularly helpful. Many of the economic myths we’ve grown up with are being systematically dispelled, so simply rebuilding the economy as it was before this collapse is inadequate. Instead, we must re-imagine how our economy functions and what we expect it to do for us. Victor’s timely new book Managing Without Growth: Slower by Design, Not Disaster argues that government should shift its focus away from economic growth as its pre-eminent policy objective towards more effective measures of well being, and offers specific ideas on how to get there within a Canadian context. Like Peter Schiff, Peter Victor will likely face strong opposition from some. Proposing to overhaul some of our most basic assumptions about how economies should function is no easy task. But that’s part of what makes it courageous, and perhaps just a little bit heroic. 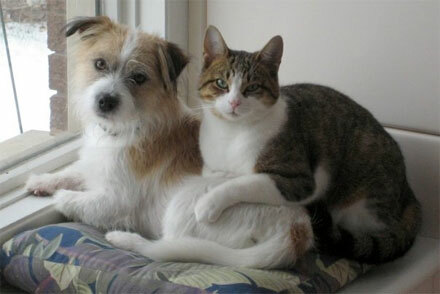 Actual photo of Claire’s parents’ dog Archie and cat Kit, taken a few weeks ago. Claire refers to them as my “dog and cat in law.” Merry Christmas! March 18th – With the completion of the March 17th by-election, I cease to be a candidate for Parliament. I inform the Toronto Centre riding association and the leadership and organizing staff of the Green Party of Canada that if there is another election in 2008 I will not be a candidate. I also inform the other groups I’m a part of (including the Federal Campaign Committee) that I will need to take some time away from volunteer duties to focus on work and family. August – Elizabeth May and I discuss the fact that since I’m no longer a prospective candidate I’ll need to be replaced on Shadow Cabinet (being a candidate is a prerequisite of being a member of SC). I suggest some people to replace me. I don’t know how to determine the exact date when I ceased to be a member of the Green Party’s Shadow Cabinet, but I am definitely no longer on SC now. November 5 – The Toronto Centre Federal Green Party Association holds an AGM. A new executive is selected; I do not stand for reelectionÂ (I was previously a member at large). December 10 – I resign from the Federal Campaign Committee. The timing was partly due to the fact that the FCC, under a new chair, restructured to include only functional positions that require a significant time commitment. In practice I had been an inactive member of the committee since the March by-election. As of right now, my only title or status with any political party is that I remain a member of the Green parties of Canada and Ontario. Finally, just to be extra clear, in case any of you were wondering I am totally not this guy.